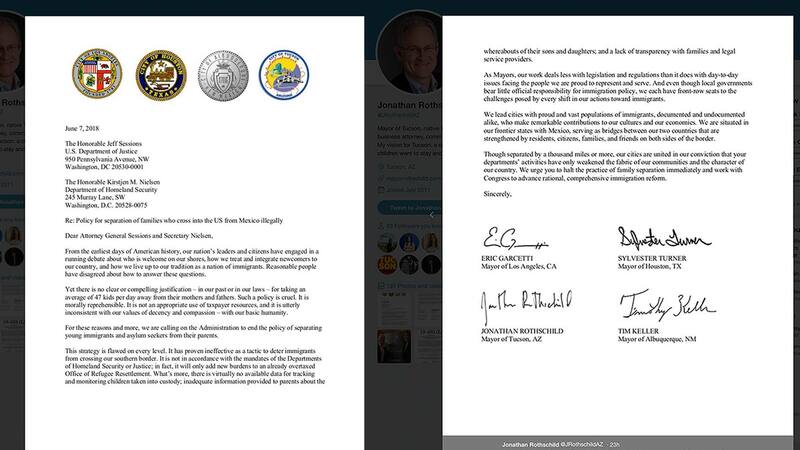 / Modified jun 9, 2018 11:16 a.m.
A letter to the Trump administration signed by the mayors of Tucson, Houston, Albuquerque and Los Angeles addressing a policy separating immigrant families seeking asylum. In an attempt to keep together immigrant families who are seeking asylum in the United States, four mayors in southern border states, including Tucson's Jonathan Rothschild, have sent a letter to the Department of Homeland Security and the U.S. Attorney General calling on the Trump administration to end the policy responsible for separating an average of 47 kids a day from their mothers and fathers. The letter signed by Rothschild, Los Angeles Mayor Eric Garcetti, Houston Mayor Sylvester Turner and Albuquerque Mayor Tim Keller calls the policy cruel and morally reprehensible. They say it goes beyond the mandates of the departments of Homeland Security and Justice. The Office of Refugee Resettlement has been tasked with reuniting families but Mayor Rothschild says the policy is a burden for the understaffed office. "All that’s going to mean is that they can't get to those cases which means these children could literally sit for months," Rothschild said. He says nationwide, the department of Homeland Security has separated more than 700 children from their parents since October of 2017, including more than a hundred children under the age of four. "That kind of trauma, that kind of official government behavior cannot leave us in good standing, that can't be good for anybody,"Rothschild said. "Such a policy is cruel. It is morally reprehensible. It is not an appropriate use of taxpayer's resources and it is utterly inconsistent with our values of decency and compassion – with our basic humanity" — letter signed by the four mayors. Today, 113 state, local and national organizations wrote to President Donald Trump urging an end to the separation of families apprehended at the U.S. border, according to the National Leadership Conference's civil and human rights coalition.